A Menagerie update at last! 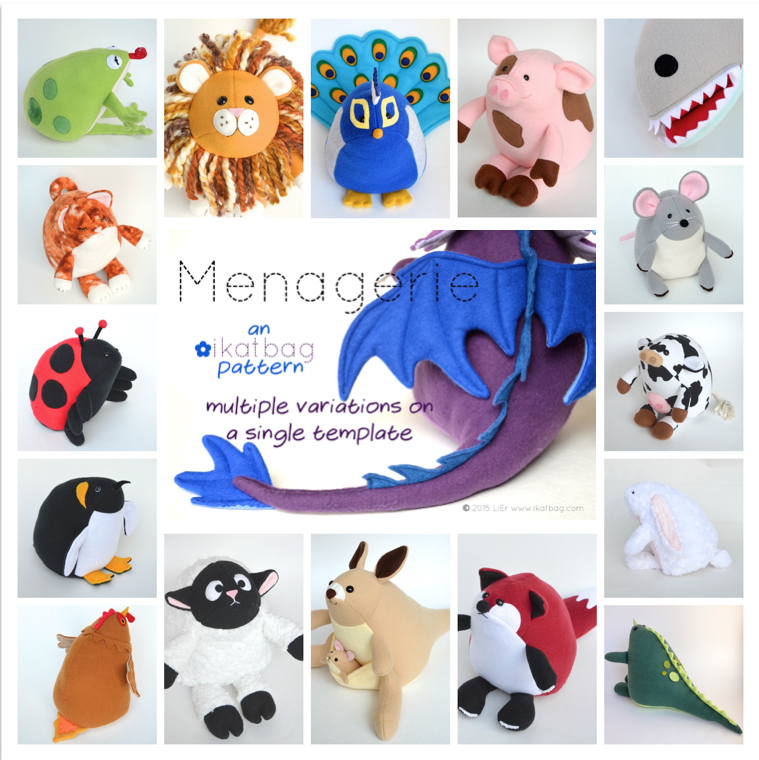 In preparation for the launch of Menagerie, that softie megapattern that I've been working on since forever (actually, just March, but it feels like millenia), I thought I'd share a printable for various hand stitches. 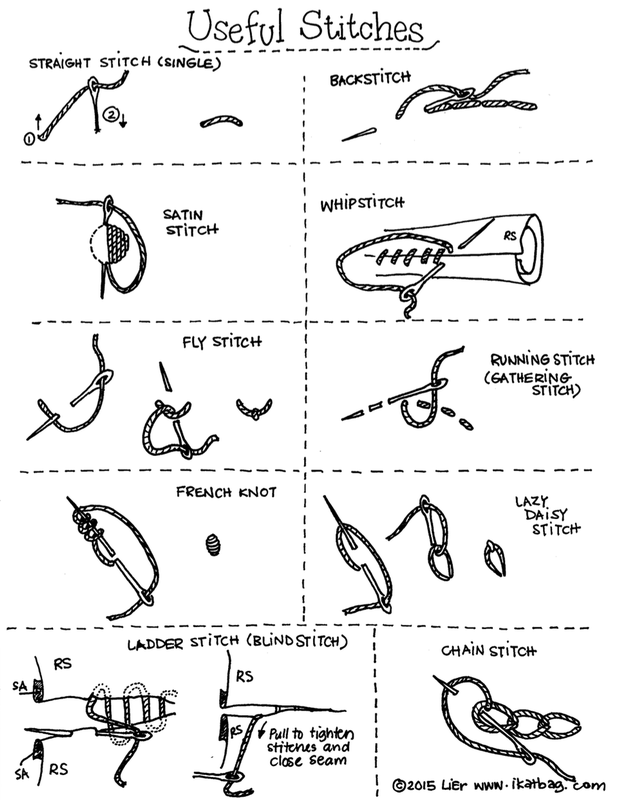 CLICK HERE TO DOWNLOAD "Useful Stitches"
Many of them are very common hand-embroidery stitches, and some are non-embellishing but useful for closures and gathering and suchlike. I thought of adding this sheet to the pattern itself, then decided to put it here so we can all refer to it when sewing softies in general, and not just the softies of Menagerie. Feel free to pin it, print it out and share it, or link to it from your own blogs and websites. 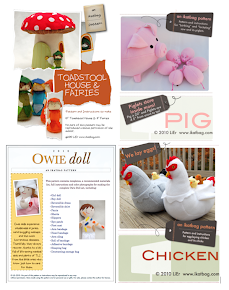 But do NOT re-source it from your own site without my permission i.e. do not upload the file to your own page so people can "conveniently" download it from there as if it were your own resource. That is beyond uncool. I only say this because it has happened before and, at the time, the nice side of me wanted to give people the benefit of the doubt that maybe they didn't know it was intellectual property theft. So now everyone knows and we can move on, yes? Next, an update on Menagerie - we're close enough to its release that I am going to say it will happen sometime in the next week or two, barring unforseen disasters. The testing lab has completed the laborious read-through of the entire pattern, based on which results I've made the necessary tweaks in the final draft. Now what remains is feedback from the actual sewing process. It shouldn't take as long as it sounds - this part is really, really fast compared to ploughing through pages and pages of text and instruction and twiddling with layout and editing and whatnot. I'm very excited to be able to finally share Menagerie with you! Thank you all for your patience and enthusiasm - I hope that when you finally hold it in your (virtual) hands, you will both enjoy it and understand why it took so long to get done. If you're new to Menagerie, you can go to my sidebar and click on the Menagerie tag and view all its animals. And yes, the Squid is in it; don't worry if you don't see it on the cover - it was a last-minute addition. Exciting! Thanks for the stitches reference. I had not gone to read about the squid jokes in your family until just now, after going out for Father's Day dinner with the family, and watching both my sons wolf down the grilled squid. The elder one will need a squid to take to college in a couple of months. I thank you in advance (and sweet work on the needle/thread illustrations!). Very much looking forward to this pattern, thanks for the update. I can't believe how much I want this pattern. I haven't been this excited about a sewing pattern in years! I am so excited about your pattern. I plan to buy it as soon as you release it... and I, too, and absolutely delighted that you included the squid. My husband worked/s with SQUIDs (as in, superconducting quantum interference devices) and I would dearly love to surprise him with a squishy squid as a gift! 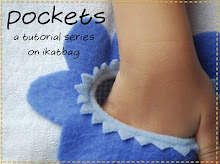 Oh, and my daughter has expressed interest in learning to sew-- and while this pattern might be advanced for a 3-year-old, I can see it being useful for many years in the future. Have I said how excited I am about the pattern?! !